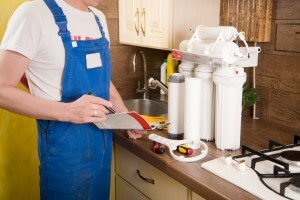 Opting for a water filtration system is something you have to decide about on your own, but you can still rely on Fisher Mechanical Inc. to provide you with the information you need to make the right choice. As the local leading plumbing company in Horsham, PA, you can rest assured that you will appreciate the high-quality service we offer. Most homeowners now have something in place to clean the air they breathe, and having purified water is just as important. Safeguard the well-being of your entire household, with better quality water for consumption and sanitation. Obviously, the most important aspect is that this is designed to rid your water of contaminants. These pollutants can be harmful to you, your loved ones and even your pets and plants. This reduces the likelihood of having minerals in your water, making it softer. Hard water leaves buildup and residue on dishes, clothing and even skin and hair. Microbial Pathogens, toxic metals and even radioactive elements could be in your water. Even if you are drinking bottled water, do you really want to be exposing yourself these types of unwanted substances?